Ameila performed on Show 242, recorded in October 2011, at age 15. 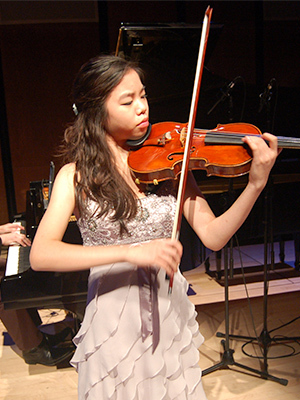 Amelia Sie (violin), 15, lives in Bellevue, Washington and attends Newport High School. She studies violin with Simon James and has attended the Meadowmount School of Music, a music summer school in Westport, New York. Amelia plays in the Seattle Young Philharmonic and has participated in the Schlern International Music Festival and the Great Wall International Music Academy. She has taken master classes with Brian Lewis, Leonidas Kavakos, Joseph Silverstein, James Ehnes, Vadim Repin, and Andrés Cárdenes. In her free time, Amelia enjoys reading, drawing, and spending time with friends.